Purchase $500 of resources and receive a 25% discount off selected resources. Our shopping cart will compute your discount just before you check out. No coupon needed. Purchase 10 or more copies of 4th edition Up and Running in 30 Days and receive a 10% discount. The shopping cart will compute the discount right before you check out. No coupon needed! Buy $300 of resources and enjoy a 10% discount of selected resources. (Excludes courses and coaching). The shopping cart will compute your discount prior to checking out. No coupon needed! plan in just a few minutes. 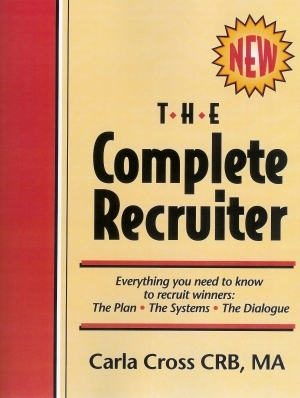 Now, the text of The Complete Recruiter is delivered to you digitally. You just download. The 3 audio CDS will be sent to you via UPS ground. Create your recruiting plan with this easy-to-follow blueprint, now with a sample plan. Dozens of strategies and tips on how to create that plan, too (and most common mistakes). Step-by-step guidance to build an effective recruiting presentation, with over 125 suggestions on what to include. Organize easily: Includes ‘topic pages’. 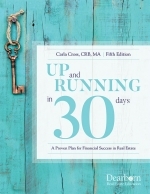 Canadian clients: You will be charged an additional Canadian government tariff, in addition to the regular UPS shipping charges from Carla Cross & Co.
Up and Running in 30 Days--new 5th edition! Great New Updates! Be sure to give us a physical address. UPS won't deliver to PO boxes. This new agent’s business start-up plan is so detailed and comprehensive, most real estate professionals would term it a ‘business plan’. Yet, it’s directed to the new agent, because it provides specific guidance in lead generation, marketing, technology, social media, and sales skills to become an exceptional agent—fast. (This program is also excellent for seasoned, challenged agents to get them back on track to success). Want training and coaching to my business start-up plan? Up and Running in Real Estate, my online training/coaching course, puts Up and Running to Work for you. Also has a coaching component with all the support you need to get a great career in 8 weeks! Thanks for exploring my unique online program, Up and Running in Real Estate. By checking out here, (and it's free), you will receive a free checklist: 30 Things to Do While You're In Pre-License School to Hit the Ground Running. (I just want to entice you to read about the UP and Running in Real Estate program with my free giveaway!). Again, this checklist is free! Managers: These systems are great for training, too. Your agent will save hundreds of hours and win much more often with a clear process to follow. And, your customer service ratings will soar! Note: You don't purchase Up and Running in Real Estate here. The program is so robust it has its own website and registration. Click here to register for the program. About Up and Running in Real Estate: This revolutionary 8-week online training/coaching program puts Up and Running in 30 Days on steroids! To see this all-new program, click here. You'll get a preview of the program, and learn everything you want to know to take that step toward a successful career. One registrant is $249, with discounts for multiple registrations. Managers can buy multiple 'seats' and have a whole year to use them. This gets the price down to as low as $179 per person! Read about quantity purchases here. International clients: This program is completely digital so you can use it anywhere in the world! You get instant access and have access for 6 months! Managers: Want to coach your agent through Up and Running in Real Estate? There's a coaching component, with all the information and guidance you need to coach your agents successfully. Check it out here. Coaching and accountability for success is very important to attain your goals. Coaches' Corner, a separate component which works with Up and Running in Real Estate, provides coaches the information and advice to coach to the Up and Running program. This spring, I'm greatly reducing the 'tuition' for Coaches' Corner. Find out more here. Don't miss this opportunity to get your career off the ground like a rocket. This program is for agents under 2 years in the business. Register for Up and Running in Real Estate here. You will pay using PayPal to purchase. Because this is a spaced-repetition, coaching program with unlimited log-ins over a period of time, there are no refunds available. Once you register you are registered! See the refund policy on our products in my website. New! EVERYTHING you need to know about real estate as a career--and how to launch a successful one. This is an eBook, and available for Kindle (designate which version you want when you order). Now in its 2nd edition! There are several documents here. The text is titled prelicenseebooktext.pdf. If you want to read this on your computer or iPad, this is the 'version' you want to download. The Kindle version/link has the mobi extension. (this is the first edition). Be sure to download ALL the docs--several excerpts from the book are provided for recruiters. This month, you'll receive 6 documents excerpted from the book for you to use for your Career Nights. (for managers). Please note: the bonus handnouts are not configured for Kindle, although, if you order the Kindle version, the documents will be included, of course, in the text. Now available to download to your Kindle. This is the one eBook you need to answer all your pre-license and post-license questions. There is no other real estate book that covers this ground! Order NOW and also receive 30 Things to Do Right Now to Hit The Ground Running (while you're in prelicense school). Click here to see an introductory video. How to get your resources: The text for the agent's resource (On Track to Success System) is now digital! To get it, follow the download directions at the bottom of your order receipt. Do so right away, since the download will expire. The rest of your resource (the On Track CDs and 3 ring binder) plus your manager's coaching companion, will be sent via UPS ground. A complete experienced agent’s coaching program here in one package: Your agents’ quick regeneration plan, The On Track to Success in 30 Days System for Experienced Agents, (see the description in the agents’ resources), along with your coaching guide, Managers: Putting On Track to Success to Work. A Professional Planned Interview Process to Choose more Winners! All updated with new information, more processes, and a video to show you how to use 'crystal ball' interview questions! This is a digital program--nothing is shipped to you. After you order the program, you will receive instructions at the bottom of your order confirmation on how to download this resource. Please download immediately. Do you sometimes wonder why the agents you wanted didn’t join you? Do you sometimes get so caught up in the interview conversation that you forget to ask some important questions? Do you find out things about your ‘candidate’ (yes, call them ‘candidates’) that you wish you’d known prior to hiring? Do you find yourself with no planned interview process? Your Blueprint for Selecting Winners will solve all these problems, and more. Good agents are judging our interview processes every step of the way. You need to demonstrate your professionalism to hire the best. This month: Buy this invaluable planning resource for 1/2 price! Designed expressly for real estate leaders (including those with teams), this unique planning system walks you step by step through the strategic planning process, while providing you dozens of strategies and tips for more profitability. Carla Cross, CRB, MA, former master level CRB(Certified Real Estate Broker) instructor, and writer of business planning courses for CRB, walks you through the systems, and gives you dozens of tips on how to be profitable, how to recruit, train, and retain successfully. It’s a combination template system, coaching resource, and it contains all the forms you need to plan—on a ‘document CD’. This is a digital program--nothing is shopped to you. This program is available to real estate professionals worldwide. Important: You won't get your materials on this site. After you order the program, you will get an email that directs you to the business planning membership site. Watch for that email. You will register on the membership site. We will approve your registration via email within 24 hours of your registration. Then, you can go to the membership site and get all your information. Owners and Managers: Are you frustrated because you can’t get your agents to complete business plans? Does your business planning for your office and your agents lack that spark, that ‘realness’, that inspiration to actually drive and teamify your agents? This package shows you exactly how to get every agent to create a business plan, and how to get an office plan that actually works! Carla Cross coaches the coach in this manager's coaching companion. She shows you exactly how to coach those experienced agents. You’ll save thousands in coaching costs, and create unassailable loyalty with your coaching expertise and program. Great recruiting tool, too. Purchase all three of these packages and save $30.00. Never get stumped by a recruiting objection again! Here are your Recruiting Objection Busters, the simple, effective method we have created to handle objections recruiting candidates ‘throw’ at us. All the scripts and dialogue you need—plus actual role plays of these Objection Busters! About this resource: The resource outline, handouts, and audio CDs now are all digital, so you get instant access. Your download instructions are in your order receipt. Everything you ever needed to know to become an exceptional trainer! Invest $99.95 and ‘hire’ your own training consultant, National Realtor Educator of the Year Carla Cross. With over 160 pages, and 30 detailed training examples and outlines, this ultimate guide covers all the bases on training: how to create a ‘stand-out’ training program, how to use your training as a recruiting tool, and how to become a confident, skilled trainer. Carla even teaches you how to create a whole training program. 164 pages/4 audio CDs in this invaluable resource! This is a digital program--nothing is shopped to you. After you order the program, you will receive instructions at the bottom of your order confirmation on how to download this resource. I've provided both the PDF versions and the Word versions so you can customize. Are new hires taking too long to get into action? Do they need a clear path to get past the operations of your office? Do you find agents not doing things the way you want them done? You could greatly benefit from creating an Operations Manual. Here it is, as a PDF and in Word, so you can highly customize this manual to fit your needs. Do You Have a System for Orientating your New Hires? This is a digital program--nothing is shopped to you. After you order the program, you will receive instructions at the bottom of your order confirmation on how to download this resource. Please download immediately. Create a step-by-step process to culturize your new hires, prove you are value-added, and get them excited about using your company materials. Those first few days with you are critical to create loyalty and appreciation for what you and your company do for your associates. Tie down that loyalty with a detailed orientation checklist for each of your valued staff to use.